Last week, “San Diego” feinted in the direction of convenience and cowardice, then turned the tables, letting each character get something they deserve. In “Five Stars For Beezus,” that cowardice—and the courage to overcome it—goes from subtext to text as Jess, Nick, and Winston all face up to fears. These last two episodes of the sixth season fit together like Jess and Nick, like Schmidt and Cece, like Winston and Furguson—I mean, Winston and Aly. I mean that congratulations sincerely. If “Five Stars For Beezus” ends up being not just the season finale but also the series finale, the writers, showrunners, and cast can be proud. They’ve given everyone a milestone and a moment in the spotlight. Sure, I could watch another year of these lovable misfits stumbling into belated adulthood. I could watch Jessica Day and Nick Miller for another 40 years, as they become (respectively) the twinkling, afghan-knitting and the growling, grizzled old folks they were born to be. There’s room to grow if New Girl returns for season seven. But if that elevator door closing on Jess and Nick as credits roll is our last glimpse of them, it’s enough. An episode so stuffed full of long-awaited milestones and breakthroughs could feel like the obligatory performance of a promise. Like Nick’s audience of young readers, or like Schmidt and Cece “watching these idiots do this dance for the last six years,” we don’t want to be told there’s no hope for the show’s OTP. Similarly, the moment Cece mentions to Jess her visit to Sadie, their mutual friend and OB/GYN, it’s not a question of whether she’s pregnant, but of how we’ll hear it. (That’s doubly true of viewers who remember Cece being sideswiped by grief over her waning fertility in “Eggs.”) With this season finale possibly standing as the series finale, and given the way its stars and creators have been discussing its outcome, there was no doubt in my mind how things would turn out in tonight’s episode. But sitcom suspense is a funny thing: You can be certain something’s going to happen and still feel a flutter when it doesn’t… yet. Meriwether’s script subverts expectations, making those foregone conclusions work for the show, not against it, by focusing less about how we find out what happens to these characters and more about how they do. Like any good farce, “Five Stars For Beezus” makes the most of its dramatic irony, letting us see clearly what the characters can’t. When Nick shatters Jess’ hopes by telling his audience there’s no romance ahead between Julius Pepperwood and Jessica Night, she doesn’t get to hear his follow-up: “Pepperwood… he blew it.” When first Jess, then Aly, accidentally intercept calls from Sadie, the suspense lies in how they’ll maneuver events to honor Cece and Schmidt’s joy. When Aly presents Winston with his father’s name and number, it’s just a matter of time before Winston swallows his worries and calls. 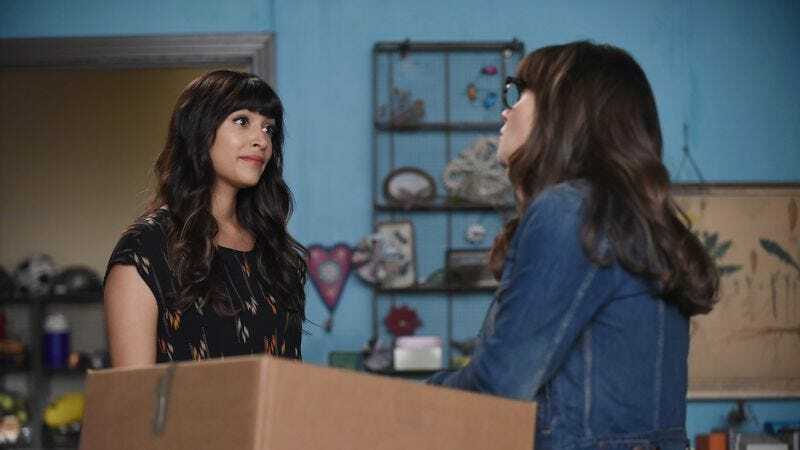 A few elements of “Five Stars For Beezus,” and of sixth-season New Girl in general, feel like they’ve been retrofitted for maximum emotional impact. We’ve never seen or heard Nick’s version of his first sight of Jess, as he watched her bumbling around outside the loft on her way to meet them. In earlier seasons, Winston’s absent father was a fact, but not a major facet of his character. But the writing and the performances smooth over these minor bumps. This show couldn’t be the well-oiled machine it is without this cast. Max Greenfield gets well-deserved attention for Schmidt’s over-the-top outbursts, but he’s great in smaller emotional moments, too, like the quiet rambling as he announces Cece’s pregnancy to her. In the same scene, Hannah Simone conveys joy, surprise, and relief with just her eyes, suggesting a whole untapped backstory of their attempts to conceive. Lamorne Morris can go from goofy to grounded in a split second, and he gives Winston’s phone call to his estranged father every ounce of gravity it deserves without feeling saccharine or out of place. His challenge to Jess—a simple “So now it’s your turn to be brave”—carries just the right weight. It’s not a childish taunt, but one adult showing another how to face their fears. Nick’s not afraid to make the suggested changes in his novel; he doesn’t want to make those changes because they’re “really bad.” And now he’s not afraid to make changes in his life, because those changes could be really good. As Nick reminisces about his first sight of Jess, Jess is reminiscing, too. A yellow cat bucket hat reminds her of the day her new roommates stood up for her, rescuing her possessions from Spencer. But it’s the oldies station Winston chooses for the drive to Portland that clinches it, calling back to New Girl’s pilot, and the fractured serenade they perform. And who led that serenade? Nick. Running from the moving truck only to be stuck outside the loft without her keys, Jess unknowingly re-enacts the first time Nick set eyes on her, and the moment he first fell for her. This scene would have more resonance for the audience if it were recreating a scene we’d witnessed before—if it were bookending a scene from the pilot, or if Nick had previously mentioned it. But there’s something sweet about the idea that his first sight of Jess resides only Nick’s mind, that it’s a memory he’s lingered over from time to time for the past six years, and that only now is anyone else hearing about it, just before we watch it play out anew. Jess runs out of Nick’s reading too quickly to hear his follow-up to the romance question: “Pepperwood… he blew it. Sometimes you don’t another chance to fix the mistake.” But sometimes you do. In classic New Girl fashion, this reunion is stymied by missed connections and over-eagerness and comical interruptions, and in classic New Girl fashion, it all works out for the silly, sappy best. Nick’s plea to a delivery man to hurry because “I gotta tell my best friend I’m in love with her,” with Jess overhearing their friendly insult-slinging, isn’t a perfect romantic moment, but it’s a perfect Nick Miller moment. To the thrum of Lorde’s “Green Light,” Nick and Jess run, stumble, and jump their way to each other. It’s a rom-com cliché because it’s a rom-com classic: The path to love is rarely smooth. But love is worth overcoming the obstacles. And once you reach it, those obstacles seem like nothing at all. If there’s one false note here, it’s the titular Beezus, Schmidt’s favorite Uber driver. Nothing about this segment adds to the episode, except by showing how Nick gets back to the loft. I can’t fault Fred Willard, who is exactly what you’d expect Fred Willard as an Uber driver to be. But it’s one clanging note in an otherwise beautifully fluid farce, and I get the feeling if the driver had been a lesser name, the scene might have been cut to good effect. Was there any doubt Nick and Jess would end up together? Apparently there was, in the showrunners’ minds. My live stream stuttered, preventing me from grabbing screenshots of Julius Pepperwood and Jessica Night cosplayers. I’ll update as soon as I can get ’em. Update: There they are, flanking Jessica Day above. That’s it for season six of New Girl. Thanks for reading!